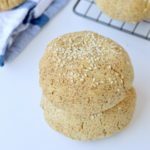 Low carb burger buns are easy homemade gluten free keto bread buns with a soft brioche texture. No yeast or eggs in those buns only nourishing almond flour, coconut flour and psyllium husk for a 100% Vegan and paleo burger. Who is missing soft burger buns with a brioche like texture ? If you are on a low carb keto diet for a while, you may miss bread a lot and that is ok. I am here to provide delicious easy low carb baking recipes to solve that bread craving with few carbs! 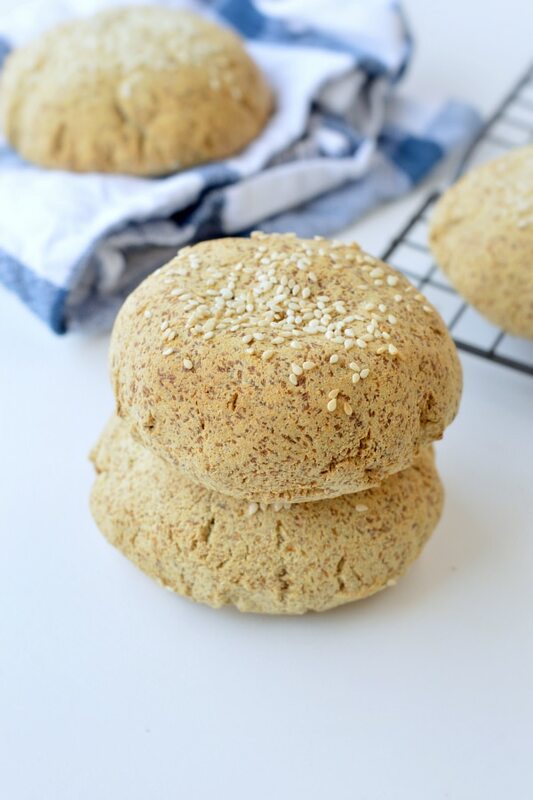 Those soft low carb burger buns are the easiest to make, very similar to my keto bread rolls recipe with a softer and more dense texture that mimic real burger buns. 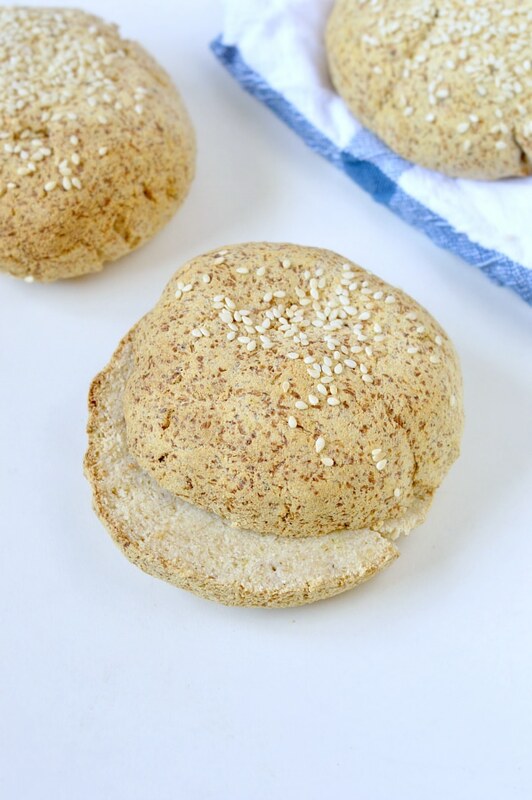 How to serve the low carb burger buns ? You can slice your buns and use them directly or toast them the oven for 1 or 2 minutes on grill. This will add a lovely crispy texture on the inside of the buns too. I like beef burger so I usually use my sugar free ketchup recipe as a sauce then add beef patties, cheese, lettuce and tomatoes. It makes the most delicious low carb cheeseburger. Those low carb burger buns has no eggs or dairy, it means you can store them at room temperature for up to 5 days. I like to wrap mine in a clean towel to keep them fresh and moist. They tend to soften with time but you can put them in a toaster to get some crisp back. You can also freeze them up to 3 months. Simply defrost the day before, on a cooling rack. I hope you enjoy this simple new bread recipe. Have a lovely burger and don’t forget to tag me on Instagram if you make those. I love to see your creation. 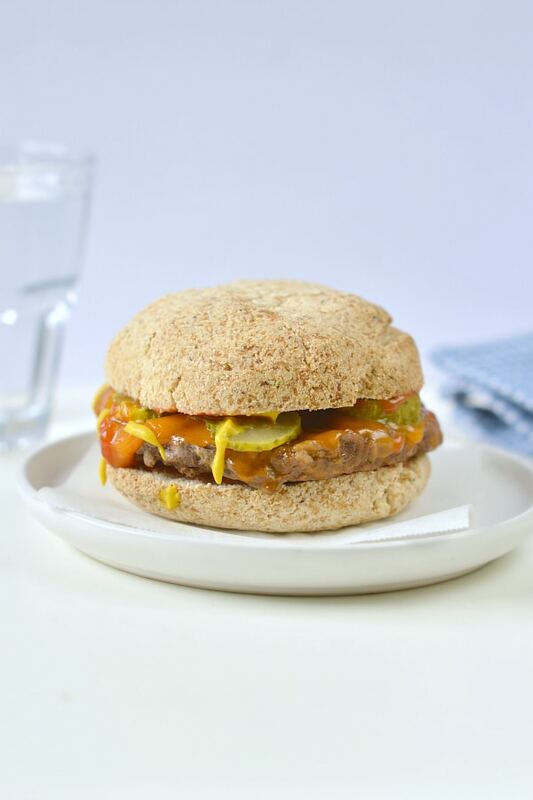 Watch the recipe video and make the low carb burger buns now ! Cover a baking tray with a piece of parchment paper. Spray oil on your paper if your paper brand tend to stick to baked goods. Set aside. Weight all your flours in separate bowls : coconut flour, almond meal and psyllium husk. I highly recommend weighting the ingredients in grams (or oz) rather than cups for perfect result. In a large mixing bowl, add all the dry ingredients you previously prepared, give a good stir. Add in the rest of the ingredients: olive oil, baking soda, apple cider vinegar salt and water. Stir vigorously with a spatula at first, for about 30 seconds. Then use your hands and knead the dough for an extra 60 seconds. It will be very liquid and moist at first getting dryer as you go. You should be able to form a ball of dough after 90 seconds. Be patient you need those 90 seconds. 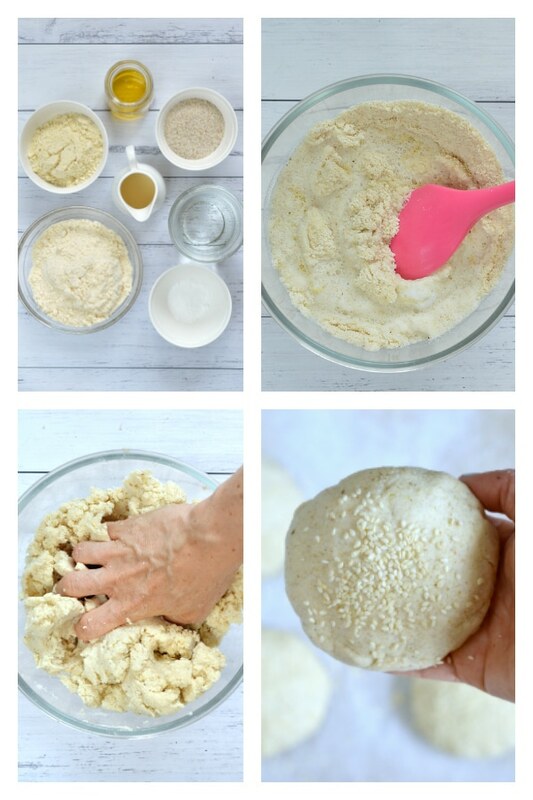 Gather the dough to form a ball, it will be very soft and moist and that is what you want. Set aside for 10 minutes in the mixing bowl. This step is crucial to let the fiber from the psyllium husk to absorb the extra moisture and create an elastic soft dough. Roll each pieces into a ball. Place each balls on the prepared baking tray, leave at least 1 thumb between each buns. They won't expand while baking by it is better if they don't touch each others. Press each balls with your hand palm, to flatten the ball slightly and form a lovely burger bun shape. 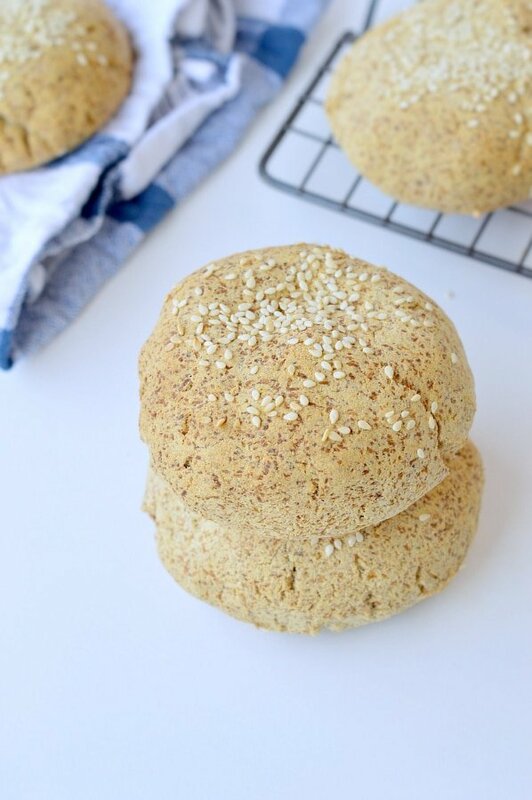 Brush a tiny amount of water on the top of each burger buns and sprinkle sesame seeds on the top. The water will stick the seeds to the top and give a crispier crust to the buns while staying soft enough in the center to mimic a brioche bun. Bake for 20-25 minutes in the center level of the oven, or until the top is crispy and brown/dark. Cool down on a cooling rack for 20 minutes. Slice in half using a bread knife. Feel free to toast the inside of the bread, on the grill mode of your oven to get the center crispy if it is how you like your burger buns. I recommend adding one slice of cheddar cheese on each burger bun half. Bring back to the oven on grill mode on top shelf for about 1 minute or until cheese is melted. Add lettuce, tomato slice, grilled onion and beef patties or any toppings you like. I recommend my sugar free homemade ketchup as a sauce. You can store them up to 5 days at room temperature. I recommend wrapping the burger buns into a clean towel to keep them moist. You can toast them or bring back to the oven few minutes before serving if you want them to crisp a little more. You can also freeze those buns up to 3 months in zip bags. I recommend slicing the buns in half before freezing. Defrost on a cooling rack the day before, at room temperature. Toast or rewarm in the oven to had some crisp on the crust. Nutrition panel is for one burger buns, the recipe serve 6 medium size burger buns. Net carbs are carbs take away fiber (6.4 g net carb per buns if 6 buns made with the dough) . 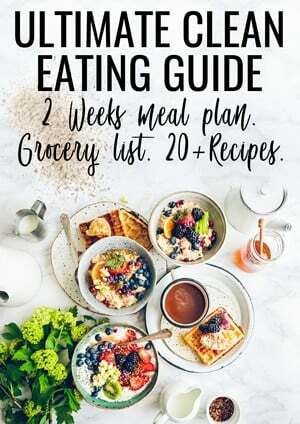 Do you have a book with all these great recipes ? Sorry my friend, no book but you can enjoy all my recipes for free on this blog! Enjoy ! XOXO Carine. Can I replace the psyllium husk using hemp seed?? No both have different properties, husk is 100% fibre so it hold the dough together and hemp seeds can’t achieve that. Enjoy the recipe, XOXO Carine. Do you use whole husk or powdered? I use powdered/ground husk. Enjoy the bread. XOXO Carine. I am sorry there is no substitute in this recipe you must use the blend of flour to get this texture. Enjoy the blog recipes. XOXO Carine. I used the psyllium husk and had an allergic reaction. Is there anything I can use as a substitute?? I’m so desperate! I can’t do eggs either! No I am sorry husk is necessary for this bun recipe. So sorry to hear about your allergy! Enjoy the recipes on the blog. XOXO Carine. OMG Carine! Made these today and they turned out so perfect. Thanks a ton for posting such an awesome recipe. I am going to try all your other vegan -GF recipes. YES! I am so happy to read this comment. Enjoy all the low carb recipes on the blog, lots are vegan gluten free. XOXO Carine. REALLY LOVE THIS RECIPE, BECAUSE IT’S DAIRY FREE & EGG FREE, TRYING TO START A KETO AIP TYPE OF DIET. ALSO, CAN I PUT THIS IN A LOAF PAN?. I did not try baking the recipe as a loaf but I am this will work very well! Enjoy. XOXO Carine. Hi I want to try this recipe but a little confused on the conversions. For example for coconut flour it’s saying to use 4.6 oz then it shows 1 cup. How is 4.6 oz equivalent to 1 cup, wouldn’t that be considered a half of a cup? 4.6 OUNCE! I updated the recipe to give you only grams and cups, much more accurate this way. I always work in cups but I provides grams for European. You can use both. Enjoy the bread. XOXO Carine. Thank you so much for the quick reply. I used the measurements in cup and made 6 buns yesterday. Omg!!! You’re a life saver for this recipe. I’m in love!!! The bread smelled amazing and tasted great!!! Thanks again. I’m going to try your flat breads next. So excited! My pleasure my friend! Any questions, just ask I am here to help. So glad you enjoy the bread. Can’t wait to hear your feedback on the flatbread now! XOXO Carine. Really like this recipe and your related recipe for coconut flatbread. Since going Keto I have become addicted to my scale and measuring ingredients. So I need to point out that a cup of coconut flour is about 65 gm, not the 130 in your recipe. I went with the 130, which turned out to work for making 6 buns. But I ended up doubling the flax and adding more water. Of course, that is going to be affected by local humidity and elevation, which is something we all have to be aware of. It was just that your recipe specified 130 gm and then translated that to 1 cup. Have to say that measuring by weight is so much better in getting consistent results and I am totally in favor of that and can sympathize with doing translations to accommodate various audiences. Thanks for your great recipes. I am sorry but 1 cup of coconut flour is 130 g of coconut flour ! You are getting confused or you are not using the same cup size as New Zealand and US. Here a cup is 250 ml in volume. Also, when measuring flour in cup you must press the flour into your cup to make sure no air stays in. If you check google converter it will tell you the same 1 cup coconut flour is between 128g/130g. Make sure you make the recipe following all the instruction in the same measurement, either all in grams or all in cups. XOXO Carine. 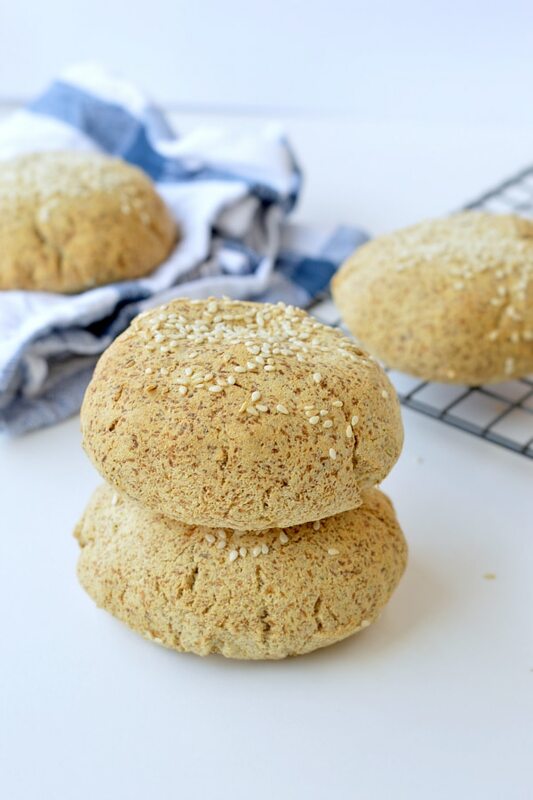 In the comments section for the keto bread rolls – vegan + no eggs you have a link to the Husk Psyllium that you used and it points to Organic India Whole Husk Psyllium are you using the same brand for the buns? Is there a big difference between powered and whole? I used many different brand, I reference few of them that worked well for me. I like to change depending on how much it cost the day I shop, that is all 🙂 The ground husk is usually more water absorbent. Enjoy the recipe. XOXO Carine. These rolls are absolutely divine. Will without a doubt make them again. Thank you for sharing all amazing recipes. I am so happy you enjoy them. XOXO Carine. Hi, I just made 4 buns and they didn’t cook from the inside even after 40min in the oven. I had to open them and bake them as “crackers”. I must say I loved the taste 🙂 Next time I’ll try making them smaller. Thank you! It looks like your batter was too wet, it should not be wet when you shape the dough as bun. If so, adjust with 1 teaspoon husk or as you said, make them smaller ! It is a great idea to make sure they bake well in the center. Enjoy the low carb recipes on the blog, XOXO Carine.